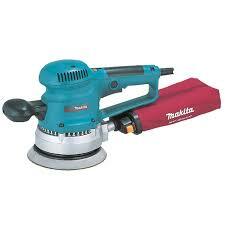 Makita BO6030 150mm Random Orbital Sander is available in 110v or 240v to buy online at Abrasives Online. Model BO6030 is a Random Orbit Sander 150mm (6") with two handles from Makita, featuring; Tough exterior construction - durable motor housing and sturdy aluminum fan housing - for pro's hard jobs. Ergonomic design for controlled operation. Optimum speed selection and assorted accessories for a wide range of sanding jobs.